Just a few days ago, it was announced that CSI: The Experience will joining forces with Skeletons: Animals Unveiled this summer to provide an exceptional educational opportunity. 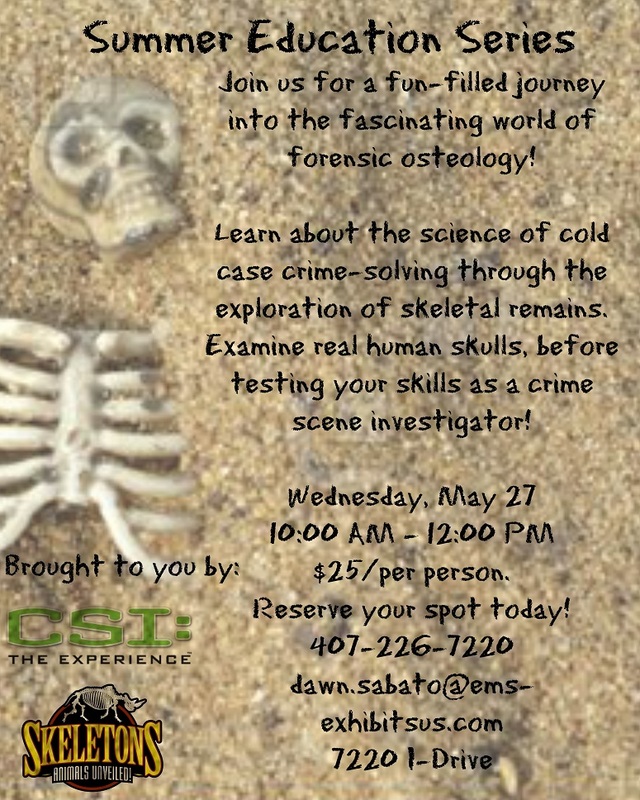 A hands-on study of forensic osteology will be done through the use of real human skulls. Immediately following this out-of-the-ordinary learning activity, Visitors will be able to test their new skills as crime scene investigators as they work on their own first official "cold case." A variety of other educational programs based around the CSI exhibit (as well as the new Leonardo da Vinci exhibit) will be offered throughout the summer - and perhaps, beyond! Program offerings will vary, as will program partners. Program activities are also available for private party or event, and are open to all ages.